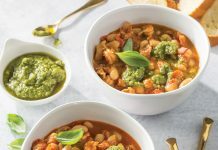 In one form or another, old French sauces are the starting point of our most popular dishes, and many have morphed over the years to suit our affinity for spice and multicultural local fl air. 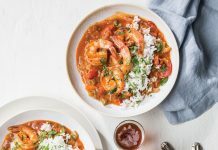 Sauces are so much a part of our culture that many of us can’t imagine a world in which we graze on sweet boiled shrimp or crispy fried green tomatoes without first topping or dunking them in one of these savory concoctions. Try this Shrimp Boil with White Rémoulade Sauce for dinner tonight. In a large pot, combine 1 gallon water, potatoes, bay leaves, thyme, peppercorns, celery seed, and fennel seed. Bring to a boil over medium high heat; cook 15 minutes. Add corn, onion, lemons, and garlic. Cook 10 minutes or until potatoes are tender. 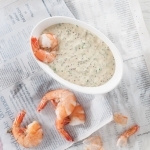 Add shrimp; reduce heat to medium, and cook for 4 minutes or until pink and firm. Drain water. 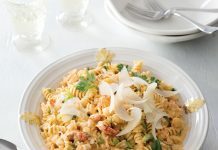 Serve immediately with White Rémoulade.